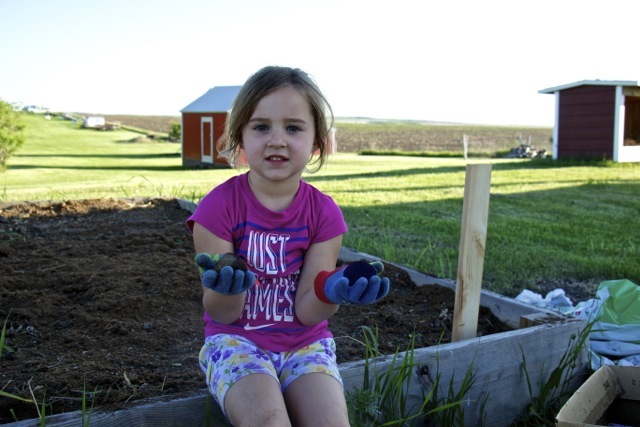 You want to teach your kids to garden? 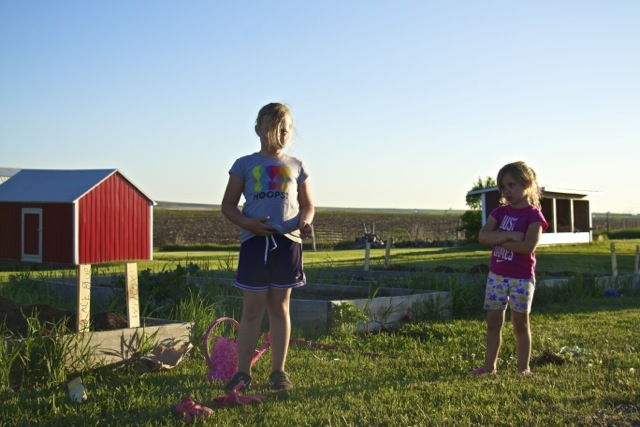 You want them to learn lessons in hard work with watering, weeding and fertilizing. You want them to experience the bounty of their work. Snap off a pea to eat. 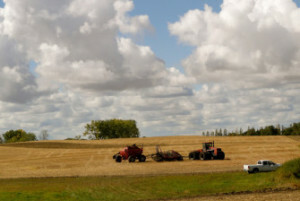 Pick beans. Dig carrots, potatoes and onions. 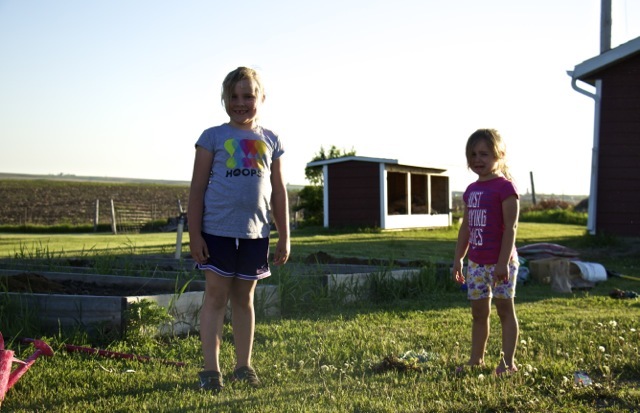 By teaching kids to garden, you teach them the beginnings of food production. It feels good to talk about, read about and I love the concept behind teaching my kids to garden. I have been trying for a few years. I’ve been honing my novice gardening skills. My only prior gardening was doing whatever my grandma told me to do in her garden. 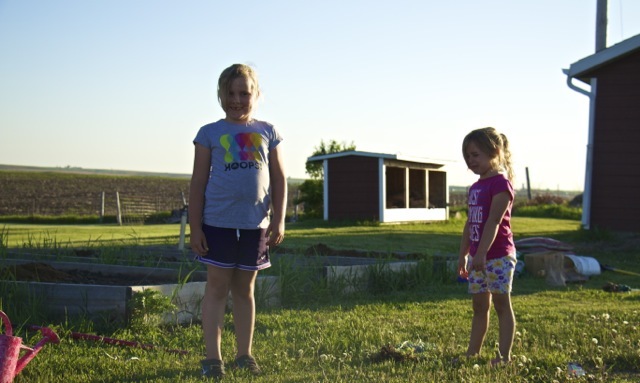 I’ve blogged about growing your own food, gardening ideas and even the life lessons learned in the garden, like when the girls throw dirt. This week, after literally going from below freezing lows just weeks ago to quickly 80 plus degree highs during the day, it was time to plant our gardens. After six months of winter, we have waited and planned for garden planting. 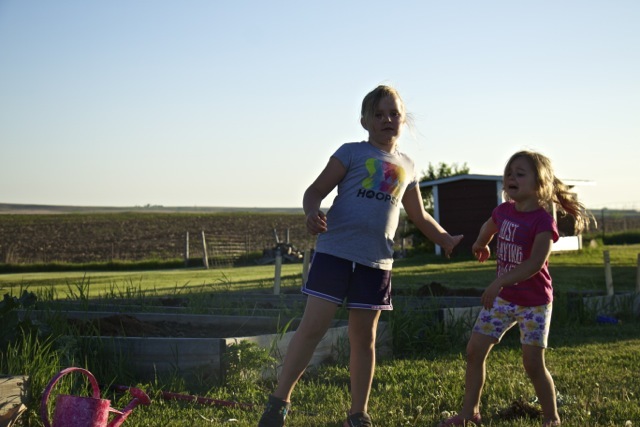 I signed the girls up for the ND Home Garden Trials Potato Pirates Project, through NDSU Extension and the Junior Master Gardener program. Miss E is nearing her “half” birthday and she will be six and A HALF as she reminds me. Miss A is a month away from her fifth birthday. At these ages, I thought they would be old enough to plant some potatoes on their own, with some guidance and direction from me, without too much hassle or drama. But I was reminded teaching your kids to garden is hard work. At least it is with my kids. Who am I kidding? Parenting is hard work. Every day. It is the most challenging and rewarding role of my life. So why did I think gardening with my sweet but strong-willed daughters would be hassle free and drama free this year. I was wrong about no hassles. I was really wrong about no drama. In their usual fashion, Miss A was mad. Miss E kept smiling, even though she wasn’t helping the problem. We trudged through the hassles and drama. The potatoes are planted. The garden isn’t finished being planted though. But we haven’t quit. You don’t get to quit in parenting. It’s not just the potatoes depending on you. It’s the kids! I felt like saying we are NOT gardening this year. I felt like quitting. Honestly. But instead, we just walked away. Took a deep breath. Gave ourselves a break. Took showers inside and read books. And tomorrow will back to planting the garden. With smiles on our faces. Tomorrow is another day! Make it a better one, no matter the task ahead of you. And if you have tips on teaching kids to garden, shoot. I am ready and waiting. All ears are listening! My 4yo loved planting seeds this year. But he had to do it by himself. I had to learn to let go of my desire for straight rows and perfect spacing and just let him plant. Tougher on me than him. This week his dad is teaching him how to hoe weeds. Our garden is not worthy of a magazine photo but it’s a space that we play in, all together, as a family. Hope your garden brings everyone joy and produce too! I have had to let go of MY control issues and designate a special area for each of the boys to have their own garden. The only rules are if you plant it, you water it, and weed it. Other than that, anything goes in their garden.